Updating your bathroom can be a very exciting endeavor, but selecting things like shower heads can become overwhelming with so many choices available. Here are a few things to consider when choosing a shower head so that you can pick the perfect one for your shower! When looking to purchase a new shower head, consider the basic type of shower head you are looking to install: one that is fixed to the wall or a handheld option. Fixed shower heads mount directly to the wall. They are completely stationary. If you do not need many bells or whistles and are looking for a budget friendly option, a fixed shower head is something to consider. An adjustable shower head mounts directly to the wall as well; however, they do offer a limited ability to move and change direction. These type of shower heads often have many wonderful options and are readily available in a variety of finishes as well. Handheld shower heads offer the ability for the user to move the shower head anywhere they want. These types of shower heads are especially nice if you have young children, pets, injured or disabled users. Single shower heads are the simplest and, quite often, the most economical option. If you don’t need a lot of bells and whistles, consider sticking to a single shower head. 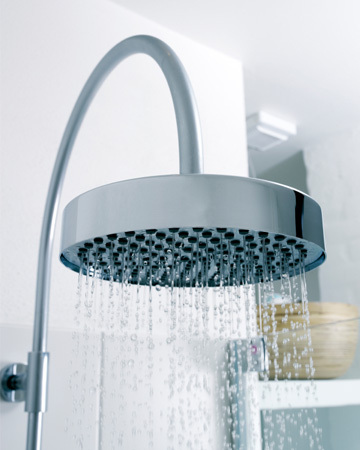 Shower systems provide a combination of an adjustable shower head plus a handheld shower head. If you are looking for maximum options, this is the way to go. Like most hardware, shower heads are available in a multitude of finishes such as oil rubbed bronze, pewter, nickel, brushed stainless, chrome etc. Coordinating hardware finishes in your bathroom helps to provide a cohesive look throughout the space. From contemporary to rustic and traditional to modern, there is no end of styles available when choosing a shower head. Find something that coordinates with the general feel of your bathroom for a cohesive look or choose something a bit more unique for an eclectic look. The amount of options and features can become very overwhelming when choosing a shower head and often, the more options, the higher the price. Pick a few options you must have and don’t worry about all of the other options. A few favorite shower head features right now include rain showers, massage settings and multi-spray options. Shower head prices range from just a few dollars to hundreds of dollars. The fastest way to narrow down your shower head options is to remember to stick to your budget and tailor all of your other choices around your price.